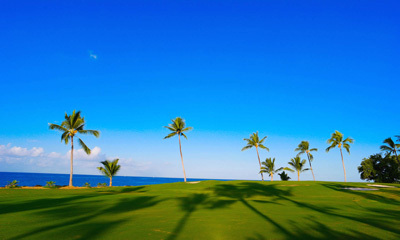 Kona Country Club provides the perfect environment for golf. Situated in scenic Keauhou just 6 miles (9.7 kilometers) away from downtown Kona on the Big Island of Hawaii, Kona Country Club features spectacular ocean views, excellent facilities and friendly service.One can always expect pleasant sunny skies and gentle ocean breezes. Kona Country Club is conveniently located near hotels and condos. We feature a fully stocked pro shop, driving range, putting and chipping greens. There is no better destination for a round of Kona golf!